You can raise heartlanders' blood pressure to dangerous levels just by telling them about a federally funded cow-flatulence study that cost taxpayers $50,000 (even if the study is very useful in understanding the spread of atmospheric toxins), but millions, billions, even trillions of dollars spent defending America against The Other is just money well spent. Defense spending is free! Everyone knows that! It adds nothing to the debt or deficit! The 2004 election was hotly contested in Wisconsin and various irregularities led to inflated claims of widespread fraud. The allegations yielded only seven substantiated cases of individuals knowingly casing invalid votes that counted- all persons with felony convictions. This amounts to a rate of 0.0025% within Milwaukee and 0.0002% within the state as a whole. None of these problems could have been resolved by requiring photo ID at the polls. Obviously, in terms of cost, there is no comparison between voter suppression efforts and war. But then, the "war on terrorism" is a far bigger deal than keeping Democratic constituencies from voting. In both cases, cost is no object. We hear little about the tax money or borrowing money from abroad when it applies to the new and improved bombing campaign in the Middle East, conducted to the tune of $200-$320 million per month. Lauren McCauley of Common Dreams notes "the costly drums of war are being beaten by the same Congress that in February slashed $8.7 billion from federal food stamp funding." 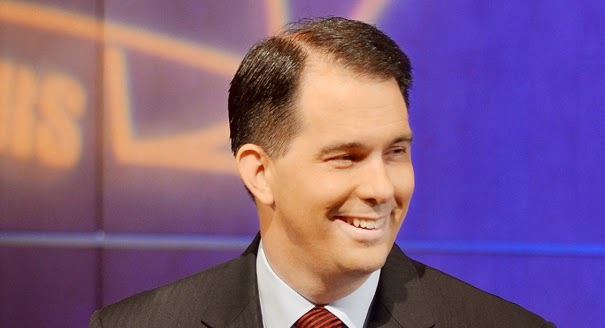 Nor is the cost of "voter security," preventing 0-1 fraudulently cast votes in his state, any concern of Governor Walker (AP photo, below). "One, 100, or one thousand"- or, more likely, zero. So if and when Administration officials, in one form or another, reveal that keeping in custody an inmate in a maximum security prison in the U.S.A. is approximately 29% as expensive as at Guantanamo, or that keeping a guy in Cuba costs the taxpayers roughly $2,622,000 more than holding him in this country, it will fall on deaf ears. Even as Islamic jihadists are beheading Americans, the White House is so eager to bring these terrorists from Guantanamo Bay to the United States that it is examining ways to thwart Congress and unilaterally re-write the law. Not only is this scheme dangerous, it is yet another example of what will be this administration’s legacy of lawlessness. Whether to keep unwanted people from voting, scaring voters about terrorists, or dropping bombs from the air and killing hundreds of The Other, money is simply not a consideration.